As India tries to build links with its neighbors, the fate of the Northeastern state of Manipur will be revealing. Since Indian Prime Minister Narendra Modi came to power in May, he has sought to project to foreign-policy watchers a renewed commitment to India’s Look East Policy (LEP) – or, as Modi’s administration has renamed it, the “Act East Policy.” The LEP was put forward in 1991 to reorient Indian foreign policy towards East Asia and Southeast Asia. But half-hearted commitment to the policy has severely restricted India’s footprint in these regions, even as Chinese influence destabilizes Indian hegemony in South Asia. Major deals with Bangladesh and Japan, in addition to a flurry of meetings between top Indian officials and their regional counterparts, have been taken as early signs that Act East represents a genuine shift in Indian foreign policy. With Myanmar, deliverables under Modi thus far have been fairly modest: an agreement to crack down on regional insurgencies, a route-mapping exercise for the long-awaited Imphal-Mandalay bus service, and continued progress on the India-Myanmar-Thailand Trilateral Highway and Kaladan Multi-Modal Transit Project. The LEP framed Myanmar as India’s overland bridge to the dynamic ASEAN belt, and Modi’s rhetoric on Myanmar has stressed his dedication to realizing this vision. But the two countries have no rail links; the only road link (Asian Highway 1, or AH-1) is insecure and poorly maintained; and there are no flights to Mandalay, northern Myanmar’s most important city. India-Myanmar bilateral trade has grown steadily over the past several decades, from Rs9.8 billion ($163 million) in 1997–98 to Rs131 billion in 2013–14. But those gains have been made entirely through sea trade. Whereas Myanmar’s overall border trade volume jumped from 8 percent in the late 1990s to almost 14 percent 10 years onwards, border trade with India actually regressed during the same period: from $72 million (cumulative, 1995/96–1999/2000) to $38 million (cumulative, 2005–06/2009–10). The deficits in India-Myanmar overland connectivity reflect a complex array of factors: Yangon’s limited control in northern Myanmar, Delhi’s fixation on transnational and internal security threats in the Northeast, and uneven bilateral relations over the tenure of Myanmar’s erstwhile military junta. But within India and Myanmar, Delhi and Yangon are not the only players influencing the progress of bilateral connectivity. If Modi wishes to live up to his rhetoric on boosting Indian ties with its eastern neighbors, he will need to work closely with local actors in the four states on the India-Myanmar border: Arunachal Pradesh, Nagaland, Manipur and Mizoram. Of these, Manipur is the most important. Manipur’s border post at Moreh, on Asian Highway 1, handles 99 percent of formal overland trade between India and Myanmar, and also the bulk of the far vaster category that is India-Myanmar informal and/or illegal trade. On a mid-January visit to Manipur, I had formal and informal conversations with an array of academics, journalists, activists, entrepreneurs, and current and former politicians and bureaucrats about Manipur and the future of India-Myanmar connectivity. I heard plenty of optimism there about the sincerity of Modi’s ambitions for boosting cross-border connectivity, but also major questions about the practical scope for change. Policy implementation in Manipur involves engaging with a variety of actors – the state government, insurgents from Manipur’s 30-odd insurgent (“underground”) outfits, the Indian Army units stationed to fight them, central infrastructure bodies – whose agendas do not always align with the needs of cross-border trade. These issues are of particular concern because India is not necessarily operating from a position of strength in border trade here. Present-day patterns favor Burmese businessmen, and Chinese and Southeast Asian manufacturers, more than they do their Indian counterparts. What’s more, even if India’s border trade position improves, it is an open question to what extent Manipur’s economy will benefit. The state’s economic struggles drive many of the dynamics that interfere with connectivity initiatives today; these dynamics will continue to cause trouble so long as those struggles persist. Overland connectivity with ASEAN has long been presented as priority for the LEP and for developing the Northeast. But those expecting that Modi’s emergence will spark a rapid transformation in the connectivity scenario – for the benefit of Manipur, and of the rest of India – would do well to temper their hopes. Reshaping Indo-Myanmar connectivity requires rewiring basic features of the development environment in Manipur, through persistence, attention to local perspectives, and skillful bureaucratic management. Success in this matter will prove a stern test of the substance of the Act East pledge. Both Delhi and Imphal have sought over the past few years to demonstrate a serious commitment to strengthening Indo-Myanmar connectivity via Manipur. For Delhi, at least, this is a somewhat new development, and certainly not an uncontested one. For most of the past seven decades, what attention the Northeast has received from Delhi has mostly come in the sphere of security: The region’s active insurgencies, and their links with Bangladesh, Myanmar, and China, provoked a policy framework that prioritized border security and anti-insurgent crackdowns. Since the early 2000s, Union (Central) Government agendas have placed greater emphasis on development and international connectivity in the region. Prime Minister Manmohan Singh’s 2012 visit to Myanmar focused on trade promotion, with deals signed to boost air and road links between Manipur and Myanmar. Manipur Chief Minister Okram Ibobi Singh took a delegation to Myanmar in May 2013 to liaise with Burmese officials on ways to boost cross-border trade. Modi’s administration has even put forward the improbably bold idea of developing Moreh as one of its 100 new “smart cities” around India. But if government-to-government initiatives suggest enhanced support from Delhi and Imphal for stronger connectivity, the actual workings of Manipur’s state apparatus – not just local authorities, but also the Union bodies engaged in the state – are far less helpful. Failures of governance have produced major levels of corruption and insurgency that generate an ugly gap between policy formulation and implementation. As noted above, cross-border transit infrastructure deficits are a major drag on India-Myanmar trade. Redressing this issue on the Indian side will require substantial investment, especially in railways and roads, the most natural channels for large-volume trading in this region. In the railway sector, such efforts are ongoing, but progress is slow. A November 2014 presentation by India-ASEAN connectivity expert Prabir De suggests that efforts to connect Imphal to India’s railway map, initiated in 2003, are slated to be completed by March 2018. An extension from Imphal to Moreh, likewise set in motion during the mid-2000s, finished its engineering survey only this year, according to the Bangkok Post; and links from Moreh into Myanmar are further off. For roads, at least, the basic infrastructure of trade already exists. Manipur connects to mainland India via two major highways. National Highway 102 (NH-102) is the extension of AH-1; it goes northwards into central Assam. National Highway 37 (NH-37) runs westwards into southern Assam. These two highways are essential not just for overland trade to Myanmar, but also for providing Manipur with the rice, petrol, cement, and other basic commodities which the state imports from other parts of India. However, both highways are plagued by shoddy construction, especially NH-37: Even in the dry season, traveling the 220 km from Imphal to Jiribam on Manipur’s western border can take 13–14 hours. The border trading environment itself is characterized by a combination of weak basic infrastructure and byzantine bureaucratic procedures. A June 2014 report by Manipur-based Hueiyen News Service notes that the town struggles to guarantee five hours’ power daily – a major obstacle to state government plans for establishing a cold storage center, a must-have for high-volume trade in a host of food products. In 2006, central government authorities approved the development of an Integrated Check Post (ICP) at Moreh – a single complex for border management authorities, intended to improve inter-agency coordination. Construction is currently halted on account of Myanmar’s claims, announced in December 2013, that the ICP site lies on its territory. In the meantime, a 2011 report on border infrastructure at Moreh suggested that maintenance of current customs facilities had dropped off since ICP development began. Such deficits work against the sort of professionalized trading operations that Delhi policymakers seek to encourage, and in fact, the vast majority of Moreh’s trade goes through informal and illegal channels. Official statistics for these channels do not exist; but estimates I have heard – both publicly available (as in these reports) and in my own conversations with experts in Manipur – indicate that the annual volumes moving through each of these channels today stands somewhere in the billions to tens of billions of rupees, far above the hundreds of millions of rupees in annual formal trade. Indeed, the volume of informal trade can be understood to indicate the mismatch between the infrastructure of formal trade and the demand for trade at Moreh. Informal trade here consists primarily of “headload trade” – goods carried across the border on one’s head, which are largely exempted from standard customs procedures. But much of this trade is actually coordinated by high-volume traders, who hire large armies of coolies to carry goods across the border. Ch. Priyoranjan Singh, an economist at Manipur University, says that, of the forty traders who obtained licenses to operate at Moreh’s formal customs station upon its establishment in 1995, just three still use them. The issues of slow execution and unsatisfactory results in connectivity infrastructure projects in Manipur follows from the authorities who implement the projects: a nexus of central and state bodies with a nasty track record of corruption and poor performance. I heard estimates of standard graft levels on road projects in Manipur reaching 66 percent of project fund allocation, with skims demanded variously by Delhi mandarins, local politicians and bureaucrats, and underground groups, among others. 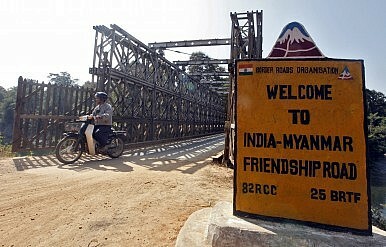 The most functional road in the region is actually the 160 km Indo-Myanmar Friendship Road in Myanmar, built from 1999–2001 by India’s Border Roads Organisation as the easternmost link in a longer intended road between the Myanmar border town of Tamu and Mandalay. But the Border Roads Organisation is now facing a central inquiry into major non-performance of maintenance and construction tasks on NH-37. Some observers offer examples of interest groups positioning themselves on connectivity issues according to their prospects of financial gain. The Indian army, for instance, has long expressed concerns that steps to boost India-Myanmar connectivity, by loosening the border, could undermine efforts against Manipur’s insurgent groups, a number of whom have permanent camps in northern Myanmar. But Priyoranjan of Manipur University questions the army’s motivations. He notes that local army figures are also important sponsors of nighttime smuggling operations whose traffic is worth billions rupees annually. The politics of insurgent-state relations in Manipur have also generated serious obstacles to connectivity. Ethnically speaking, Manipur’s three major ethnic groups – Meiteis, Nagas, and Kukis – are closer to the peoples of northern Myanmar than they are to those of mainland India, and the accession of the state into India in 1949 occurred under heavy pressure from the Indian government. These issues were aggravated by economic alienation, as Partition severed Manipur from most natural trading links to the outside world, on the coast of modern-day Bangladesh. Violent Meitei insurgencies had emerged in Imphal and the surrounding valley areas by the late 1970s. Delhi responded with aggressive paramilitary campaigns backed by the Armed Forces (Special Powers) Act, which sanctioned the use of deadly force by central security forces against citizens “acting in contravention of any law or order.” The law has weakened the foundations of criminal justice in counterinsurgency operations in Manipur while also generating what many observers have called a “culture of impunity” extending into state security personnel as well. This governing strategy has worked as ideological justifications for underground groups, as organizations fighting back against maltreatment by the Indian state. Like many other Northeastern insurgencies, the Manipur underground’s penchant for criminality has seriously weakened their legitimacy in recent years amongst large segments of Manipur’s population. But the insurgencies’ persistence and strength owes much to the fact that, for decades, they have found popular support on these grounds. The underground forces have declined in manpower over the past several decades, but the security establishment has fought aggressively against revisions to AFSPA. In late 2014, Home Minister Rajnath Singh ruled out revisions to AFSPA in the near future. Given the BJP’s assiduous courting of key security players, a change seems unlikely. Even when the roads are open, passengers and truckers along these roads contend with an extensive series of extortion checkpoints set up by the underground or army and police officials. Fieldwork presented in a recent thesis by Sanabam Gunjait Mangang of the University of Calcutta claims the existence of 20 such checkpoints along each of NH-37 and the Imphal-Moreh stretch of AH-1, as well as another 15 along NH-102 from Imphal to the city of Dimapur in Nagaland. Security officials use bribes and political connections to jockey for position along these routes, with Imphal-Moreh the most desirable, followed by Imphal-Dimapur. Insurgent extortion often occurs with the blessing, tacit or otherwise, of local officials. As regards the impacts of corruption and insurgency on connectivity, the stakes for improvement are high. At Moreh today, the most powerful traders are businessmen from not India but Myanmar, selling Chinese and Southeast Asian goods. Dulali Nag’s 2010 report for the Calcutta Research Group describes how the Burmese military’s establishment of Namphalong market in the 1990s, right by the gate for headload trade on the border, undid the patterns of trade that had ruled Moreh since the early 1960s. Historically, imports into India were coordinated by Moreh-based Indian businessmen with diasporic connections in both Myanmar and India. But wholesale and retail customers now skip the middlemen at Moreh to purchase directly from Namphalong market, whose shops stock mostly Chinese and Southeast Asian goods – cheaper, and often of better quality, than their Indian counterparts across the border. More recent writings on Moreh confirm the persistence of these basic dynamics. A major part of the blame for Indian goods’ price disadvantage lies with poor infrastructure and endemic extortion along the transit corridors running up through Moreh. The existing imbalance means that Indian goods will not gain competitive edges by steps that nibble around the edges of the connectivity deficit; such edges will follow only from major progress. Manipur’s 2017 Elections: Hopes for Change? Could a change in local government improve conditions for boosting cross-border trade? Congress’s Okram Ibobi Singh is enjoying his third term as Manipur’s chief minister, and his second at the head of a simple-majority Congress administration. His reputation for graft earned him the nickname “10 Percent Ibobi,” for the cuts he demanded from sundry projects; a number of people in Manipur joked with me that the nickname was outdated, his takes had increased. Singh’s long tenure owes also to good ties with the insurgencies and the local security establishment. The next two strongest parties in the current legislature, the Trinamool Congress (seven seats) and the Naga People’s Front (four seats), pose no threat to Congress’s rule; neither have the capacity to be more than side players. Instead, the most likely challenger is Modi’s Bharatiya Janata Party, whose share in the legislature has never exceeded 10 percent. Its capacity suffered in the early 2000s under a ban in the Valley imposed by the Meitei underground, in retaliation for gestures by the BJP-led central government in 2001 that signaled (very) tentative acknowledgment of the NSCN-IM’s demand for Greater Nagaland. The BJP did not win seats in either 2007 or 2012, even as enforcement of the ban was already waning. Nonetheless, most observers I spoke to in Manipur suggested that the BJP stands a real chance of forming a coalition government in the 2017 elections. State BJP figures have based their appeals on an anti-corruption message and on their association with Narendra Modi, whose message of development-based governance seems to have been met with cautious interest in the state. Such is their public message. But there is good reason to question whether a BJP-led administration would do much to change the politico-economic environment that constricts cross-border trade through Manipur. As regards the anti-graft platform, the state BJP leadership’s reputations are not necessarily much better than the targets of their criticism: reporting by Imphal-based journalist Yambem Laba, for instance, has raised questions about corruption by state BJP president Thounaojam Chaoba Singh. The leadership is also riven with infighting, a issue which helped derail the BJP’s efforts in the most recent legislative election in Manipur, a state legislature by-election in October 2014. A number of people I spoke to in Manipur suggested that the BJP may end up relying on efforts to convince sitting Congress legislators to switch parties in the months before the poll. Such a strategy, of course, involves inheriting many of the networks that make meaningful changes in the state’s role with the political economy of Manipur even more unlikely. For these reasons, the significance of a BJP administration for Manipur may ultimately depend upon the sort of relationship it builds with the national BJP – that is, whether Modi and his party are content with just having another state in its pocket, or whether they see BJP control in Manipur as a tool for reshaping local governance. Still, even if Congress holds its majority, New Delhi has a powerful tool for shaping its behavior: money. The state government is helpless without central government transfers, which constituted 89 percent of state revenues from 2010-13. Central government monitoring of state government projects (and those of the Border Roads Organisation, a central government body) has long suffered on account of a combination of influences in Delhi: graft, indifference towards the Northeast, political deal-cutting. Focused leadership could weaken the hold of these influences and make space for heightened accountability. Modi’s signals on Act East have spurred cautious optimism among many of Manipur’s elites that the new prime minister is genuinely committed to boosting regional connectivity. But my interviews in Manipur pointed to a complementary pessimism over the significance of pro-connectivity initiatives for Manipuris. Many observers fear that the benefits of greater connectivity will accrue far more to mainland Indians than to Manipuris. Manipur’s weak economic base is the main cause for concern. Manipur’s proximity to Myanmar gives its one edge in supplying goods for, or in attracting businesses with an interest in, cross-border markets. But even as that proximity becomes more valuable, the state’s weak economic performance points to a host of other factors that will discourage capital from locating here. Gross state domestic product in Manipur averaged 5.19 percent annual growth rates between 2004–05 and 2012–13, well below the all-India average of 7.96 percent. Average output growth in Manipur’s industrial sector (from 2005–06 to 2013–14) was especially weak: 1.69 percent, versus the national average of 6.87 percent. Union government statistics on state industrial sectors in 2007–08, taken against 2011 population figures, allow for rough calculations on per capita factory density in each state; Manipur is securely in the bottom quintile. The sector is heavily constrained by poor infrastructure, most dramatically in terms of power supply. Manipur’s electricity transmission and distribution loss in 2007–08 and 2008–09 hovered around 50 percent – only Jammu and Kashmir are worse. Meanwhile, agriculture, per 2008–09 state statistics, employs more than half of the state’s labor force. But a preponderance of small-holding subsistence farmers means that the state relies upon imports for a variety of essential foodstuffs. Commercially-minded growers in more vibrant sectors like horticulture are held back by basic infrastructure bottlenecks – for instance, a statewide absence of cold storage facilities. In terms of human capital, literacy rates in the state are strong: 79 percent as of 2011, as opposed to the all-India average of 73 percent. But the lack of economic opportunities restricts the development of what one might call commercial human capital—business acumen and experience. Even in the border trade sector itself, Manipuris have traditionally been marginal players. Moreh has long facilitated small-scale exchange between locals, but the town has served an important node in larger trading networks ever since the early 1960s, when traders from mainland India’s oppressed diaspora in Myanmar settled here. Most significant were the Tamils, who had grown from just 200 in the early 1960s to 13,000 in 1980, though Marwari and Punjabi families also played an important role. The mainlanders’ reliance upon kinship ties made these networks inherently difficult for Manipuris to penetrate. Manipuris also suffered from a lack of commercial human capital; the state had no tradition of capitalist commerce or of large-scale trading, and its economic isolation in post-Partition India had exacerbated these deficits. In the past two decades, mainland Indian populations have declined significantly, and Nag says that Namphalong’s emergence has boosted the position of aspirant Meitei traders, who can leverage their diasporic links in Myanmar. But my interviewees suggested that any inroads by the Meiteis should not be exaggerated, and that, in regards to formal and informal trade coordinated from the Indian side, mainland India communities are still far more powerful. Instead, the Manipuris most effectively integrated into the local political economy of trade are largely those in the insurgencies and in army or state government positions, via highway extortion, graft, and illegal trade. Left unresolved, the state’s weak economic base will restrict avenues for Manipuris to take advantage of the opportunities that stronger connectivity brings. My interviews suggested that some sectors are in relatively better positions – niche ones like medical tourism from northern Myanmar, and also potentially broader ones like horticulture, mentioned above, and standard-issue tourism. (Elevated investment in tourism has run into trouble with the sudden cancellation of the 2007 North East Industrial and Investment Policy and its investment incentives; but New Delhi assures that the cancellation is only temporary.) The best-case scenario would see such sectors survive the state’s formidable deficits in infrastructure and law and order to lay a foundation for a more competitive economy. Judicious central government engagement here will be essential: targeted infrastructure funding, steady incentives for investment, and somehow, some way, improved mechanisms of accountability. Connectivity may not deliver much for Manipur without concurrent improvements in the state’s economic base. But local development will also be a boon for connectivity, by weakening the nexus of corruption and insurgency outlined above. With the underground’s ideological underpinnings corroding, their strength rests more and more upon their ability to offer Manipur’s youth access to income amidst a bleak local economy. Meanwhile, local underdevelopment boosts corruption’s hold on the local economy: Almost all large-scale investment in the state, and hence almost all opportunities for accumulating wealth, comes through public expenditure. The place of Manipur within Indo-Myanmar connectivity represents a serious test for Modi’s government – of its ability to impose its agenda, and of its sensitivity to local concerns. Stronger connectivity requires major infrastructure initiatives: In one of India’s most corrupt states, can rails and roads be done right? Stronger connectivity also requires recognition of the development needs of Manipuris: To what extent will such issues feature on Modi’s connectivity agenda? The Indian government, in policy design and implementation, does not have a sterling record on these questions. And its leverage is greater over some bodies than others. But only the central government has the combination of resources and responsibilities to coordinate between, and try to shape the behavior of, the various players of Manipur’s political economy – interest groups in the central government itself, state authorities, the security establishment, and local underground and civil society players. Success in these efforts would demand special persistence and focus from Modi and his team, and from those who follow them. But the benefits could be enormous: a more stable and prosperous Manipur, emerging overland trade corridors to ASEAN, and new diplomatic leverage in East and Southeast Asia for other priorities. That is truly Acting East. Edmund Downie is a Yale University Gordon Grand Fellow at the Calcutta-based Centre for Studies in International Relations and Development, studying Indian regional integration with East and Southeast Asia.